Gothic art was a Medieval art movement that lasted about 200 years. It began in France out of the Romanesque period in the mid-12th century, concurrent with Gothic architecture found in Cathedrals. By the late 14th century, it had evolved towards a more secular and natural style known as International Gothic, which continued until the late 15th century, where it evolved into Renaissance art. The primary Gothic art mediums were sculpture, panel painting, stained glass, fresco and illuminated manuscript. Gothic art told a narrative story through pictures, both Christian and secular. The earliest Gothic art was Christian sculptures, born on the walls of Cathedrals and abbeys. Christian art was often typological in nature (see Medieval allegory), showing the stories of the New Testament and the Old Testament side by side. Saints' lives were often depicted. Images of the Virgin Mary changed from the Byzantine iconic form to a more human and affectionate mother, cuddling her infant, swaying from her hip, and showing the refined manners of a well-born aristocratic courtly lady. Secular art came in to its own during this period with the rise of cities, foundation of universities, increase in trade, the establishment of a money-based economy and the creation of a bourgeois class who could afford to patronize the arts and commission works resulting in a proliferation of paintings and illuminated manuscripts. Increased literacy and a growing body of secular vernacular literature encouraged the representation of secular themes in art. With the growth of cities, trade guilds were formed and artists were often required to be members of a painters' guild—as a result, because of better record keeping, more artists are known to us by name in this period than any previous, some artists were even so bold as to sign their names. Gothic sculptures were born on the wall, in the middle of the 12th century in Île-de-France, when Abbot Suger built the abbey at St. Denis (ca. 1140), considered the first Gothic building, and soon after the Chartres Cathedral (ca. 1145). Prior to this there had been no sculpture tradition in Ile-de-France—so sculptors were brought in from Burgundy. The French ideas spread. In Germany, from 1225 at the Cathedral in Bamberg onward, the impact can be found everywhere. The Bamberg Cathedral had the largest assemblage of 13th century sculpture, culminating in 1240 with the Bamberg Rider, the first equestrian statue in Western art since the 6th century. In England the sculpture was more confined to tombs and non-figurine decorations (in part because of Cistercian iconoclasm). In Italy there was still a Classical influence, but Gothic made inroads in the sculptures of pulpits such as the Pisa Baptistery pulpit (1269) and the Siena pulpit. A late masterwork of Italian Gothic sculptures is the series of Scaliger Tombs in Verona (early-late 14th century). Gothic sculpture evolved from the early stiff and elongated style, still partly Romanesque, into a spatial and naturalistic feel in the late 12th and early 13th century. Influences from surviving ancient Greek and Roman sculptures were incorporated into the treatment of drapery, facial expression and pose. Dutch-Burgundian sculptor Claus Sluter and the taste for naturalism signaled the beginning of the end of Gothic sculpture, evolving into the classicistic Renaissance style by the end of the 15th century. Painting in a style that can be called "Gothic" did not appear until about 1200, or nearly 50 years after the start of Gothic architecture and sculpture. The transition from Romanesque to Gothic is very imprecise and not at all a clear break, and Gothic ornamental detailing is often introduced before much change is seen in the style of figures or compositions themselves. Then figures become more animated in pose and facial expression, tend to be smaller in relation to the background of scenes, and are arranged more freely in the pictorial space, where there is room. This transition occurs first in England and France around 1200, in Germany around 1220 and Italy around 1300. Painting (the representation of images on a surface) during the Gothic period was practiced in 4 primary crafts: frescos, panel paintings, manuscript illumination and stained glass. 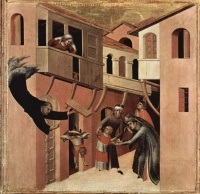 Frescoes continued to be used as the main pictorial narrative craft on church walls in southern Europe as a continuation of early Christian and Romanesque traditions. In the north stained glass was the art of choice until the 15th century. Panel paintings began in Italy in the 13th century and spread throughout Europe, so by the 15th century they had become the dominate form supplanting even stained glass. Illuminated manuscripts represent the most complete record of Gothic painting, providing a record of styles in places where no monumental works have otherwise survived. Painting with oil on canvas does not become popular until the 15th and 16th centuries and was a hallmark of Renaissance art. In Northern Europe the important and innovative school of Early Netherlandish painting is in an essentially Gothic style, but can also be regarded as part of the Northern Renaissance, as there was a long delay before the Italian revival of interest in classicism had a great impact in the north. Painters like Robert Campin and Jan van Eyck, made use of the technique of oil painting to create minutely detailed works, correct in perspective, where apparent realism was combined with richly complex symbolism arising precisely from the realistic detail they could now include, even in small works. Although there was far more secular Gothic art than is often thought today, as generally the survival rate of religious art has been better than for secular equivalents, a large proportion of the art produced in the period was religious, whether commissioned by the church or by the laity. Gothic art emerged in France in the mid-12th century, with the Basilica at Saint-Denis built by Abbot Suger the first major building. New monastic orders, especially the Cistercians and the Carthusians, were important builders who developed distinctive styles which they disseminated across Europe. The Franciscan friars built functional city churches with huge open naves for preaching to large congregations. However regional variations remained important, even when, by the late 14th century, a coherent universal style known as International Gothic had evolved, which continued until the late 15th century, and beyond in many areas. The principal media of Gothic art were sculpture, panel painting, stained glass, fresco and the illuminated manuscript, though religious imagery was also expressed in metalwork, tapestries and embroidered vestments. The architectural innovations of the pointed arch and the flying buttress, allowed taller, lighter churches with large areas of glazed window. Gothic art made full use of this new environment, telling a narrative story through pictures, sculpture, stained glass and soaring architecture. Chartres cathedral is a prime example of this. Gothic art was often typological in nature, reflecting a belief that the events of the Old Testament pre-figured those of the New, and that that was indeed their main significance. Old and New Testament scenes were shown side by side in works like the Speculum Humanae Salvationis, and the decoration of churches. The Gothic period coincided with a great resurgence in Marian devotion, in which the visual arts played a major part. Images of the Virgin Mary developed from the Byzantine hieratic types, through the Coronation of the Virgin, to more human and initimate types, and cycles of the Life of the Virgin were very popular. Artists like Giotto, Fra Angelico and Pietro Lorenzetti in Italy, and Early Netherlandish painting, brought realism and a more natural humanity to art. Western artists, and their patrons, became much more confident in innovative iconography, and much more originality is seen, although copied formulae were still used by most artists. The book of hours was developed, mainly for the lay user able to afford them - the earliest known example seems to have written for an unknown laywoman living in a small village near Oxford in about 1240 - and now royal and aristocratic examples became the type of manuscript most often lavishly decorated. Most religious art, including illuminated manuscripts, was now produced by lay artists, but the commissioning patron often specified in detail what the work was to contain. Significant Gothic artists, listed chronologically. Unless indicated otherwise, the text in this article is either based on Wikipedia article "Gothic art" or another language Wikipedia page thereof used under the terms of the GNU Free Documentation License; or on original research by Jahsonic and friends. See Art and Popular Culture's copyright notice. This page was last modified 06:37, 2 March 2014. This page has been accessed 9,032 times.